My grandmother taught me stories from the Bible and took me to Sunday church services as a child. But before I had my own family, I was living a bad life. The Christian women in Urapunga prayed that men would become leaders in the church and specifically prayed for me. I felt that God was calling me to leave my bad life and follow the way of Christ. God changed my life. I was baptised. Since I have followed Christ’s way, the community have also noticed the change in me and I have been recognised as a community leader and representative of my people at Urapunga and in Ngukurr. The next year I started the Literacy course at Nungalinya College, and then moved on to the Certificate III in Theology, which I completed in 2015. This year I have started the Certificate IV in Theology. In 2015 I assisted with teaching Old Testament in the Certificate III Theology course. The non-Indigenous teacher would explain the Bible to the students, and then I would make a connection between the story of the Israelites and the cultural practices of our people. This helps the students understand the Bible, and they would then share what they learned with the rest of the class. In Urapunga, Aboriginal people who have graduated from the Certificate III Theology course are putting what they have learnt into practice. They are leading the evening fellowship service, reaching out to the community and providing pastoral care to people. I showed photos of the Certificate III graduation to the Urapunga school children, to help them understand what’s possible for them to achieve. A group of us who have been training at Nungalinya are also hoping to teach Scripture in Urapunga School. Please pray that God will keep us strong so that we can continue to reach out to our community. Pray that more young people will join our church and go to Nungalinya College – that they will accept the challenge to commit their whole life to the Lord and rely on him in all things. The word of God was first planted in me through my Grandma, who worked with the church in Numbulwar. She took me to Sunday school and would bring back Bible pictures from the Bible Translation Centre. I graduated with a Certificate III in Theology from Nungalinya College in 2014. Last year I started my Certificate IV in Theology and taught Pastoral Care. In 2016 I will be teaching ‘God’s Story’ (the whole story of the Bible). As an Aboriginal person, I love being an Assistant teacher at Nungalinya, although at first it was scary standing up and talking in the English language. You don’t know what God can do with you when you try new things. In this teaching work, I’m like a ‘backyard’ for the Aboriginal students, in that I come from a place that they know. I know what’s in our country so I use this to help explain the Bible to the students. For example, we don’t have sheep (in our lands), but when Jesus talks about sheep, I can relate this to things in our country, and this helps make the Bible come alive. 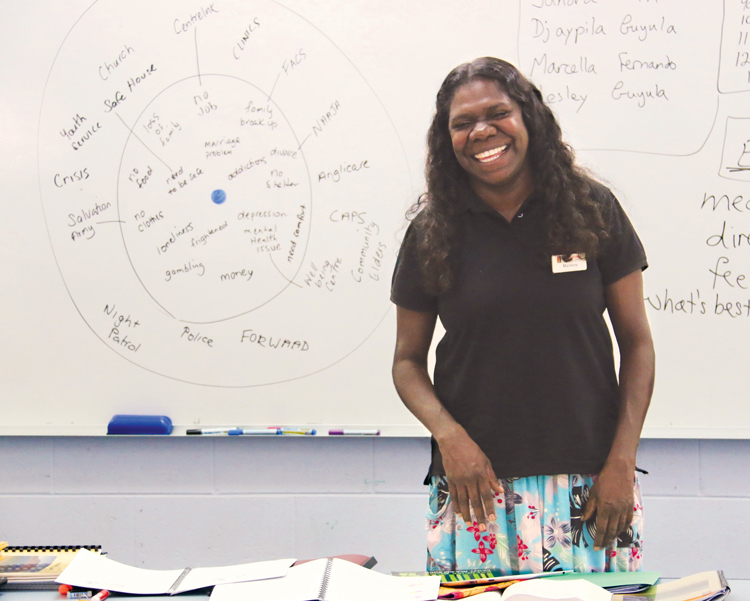 Through teaching at Nungalinya I’m learning that it’s really important for Aboriginal students to understand that they are part of the body of Christ – that we have to work together with one heart, one spirit and one mind. We have to see the love of Jesus for us and share it with people who don’t know him. Prayer is a connection, like a power line going to the power source. Prayer releases that power, so please pray for strength for me and for all my people, and that we would be united by God’s love. I learned about Jesus from listening to my parents. God prepared the way for me to become an Assistant Teacher, especially through what I have learned at College. In 2015 I started my Certificate IV in Theology, and I taught Pastoral Care with Liz McCoy and also leading worship. I’ve enjoyed teaching people from different communities and learning from the students and the staff. One of the reasons it’s important for us to be teaching at Nungalinya is that a lot of students don’t understand much English. Although the students speak many different languages, I believe God has chosen Kriol to be the main language that I use to help give students a better understanding of English (because it uses Aboriginal grammar). I think our work as Aboriginal teachers is helping give students (and ourselves) a better understanding of how to relate to our communities when we come home from our study intensives at the college. One time when I came home I got angry with the whole community, but I have since learned this wasn’t the right thing to do. Also, people see the good things Nungalinya students do in our communities and churches, and they want us to continue doing those things so that it will bring them closer to God. Pray for peace in Ngukurr and for the Church to be united and strong so that we can help people in the community. Pray that the Church would seek to please God, not the world. Your financial partnership with CMS helps enable James, Mandy and Marlene to teach Aboriginal Christian leaders so that they have a deeper understanding of God’s word. If you would like to get involved in this life-changing work through CMS, contact your local branch.